AUCKLAND, 3 May 2016 – Statistics released today by Realestate.co.nz for April 2016 show that strong demand means available inventory weeks of property for sale in Wellington is down a record 61% on the same time last year (April 2015). “That’s an all-time low for any region and also the lowest level ever recorded for Wellington,” says Brendon Skipper, CEO of Realestate.co.nz. 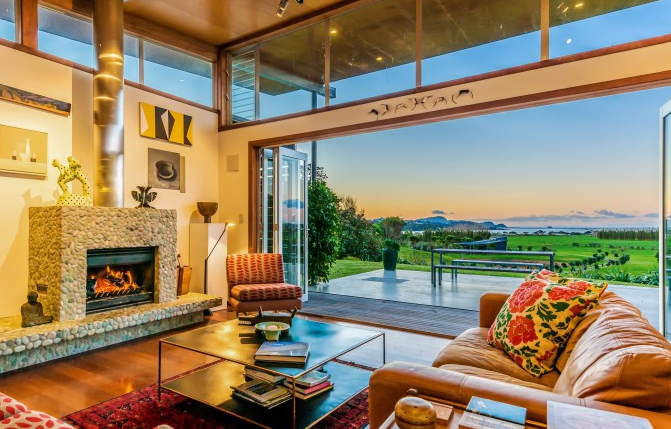 “It means that theoretically if no new listings were to come onto the market, all available property for sale in Wellington would sell out in only 5.6 weeks,” he says. Inventory measures the amount of property on the market at any one time. In the first quarter of 2016 it has dropped significantly in Wellington. “With the lower level of stock on the market and buyers still out there, it’s certainly a sellers’ market,” says Brendon. In terms of price, the April average asking price in Wellington has risen by two per cent from the previous month to $506,532, which is an all-time high for Wellington. 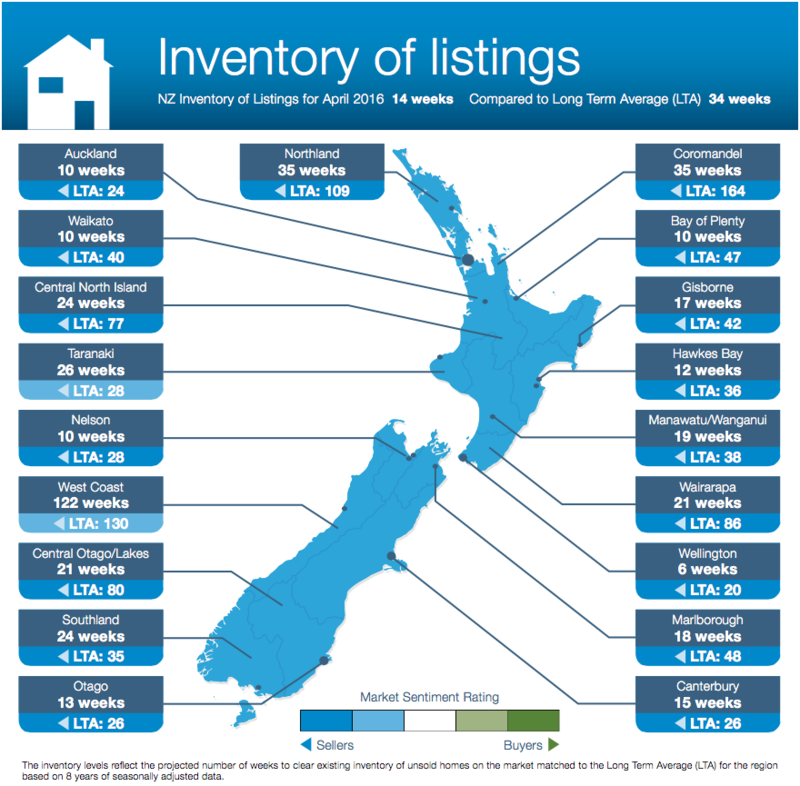 Across New Zealand, Realestate.co.nz statistics show it’s a strong sellers’ market, with the inventory of listings for April showing of the 19 regions measured, all favour sellers by market sentiment (refer graph: NZ inventory of listings for April 2016, compared with long term average). “While historic sales data is important, for buyers and sellers it’s equally important to know what’s happening right now in their own market, so they can make informed decisions,” says Brendon. “As always, it’s the properties that are priced appropriately within the context of the market that will sell quickly,” he says. In Auckland, weeks to sell fell by 2.78% in April 2016, compared with the same time last year. Nationally, the inventory of listings is at the lowest level ever recorded by Realestate.co.nz since January 2007 when statistics were collected via the site (refer graph – NZ Property Market Inventory). The inventory of listings for all regions in April 2016 was 14 weeks compared to the Long Term Average of 34 weeks. While Auckland and Wellington recorded a decrease in the number of new listings during the month of April (compared to April 2015), sellers in Waikato, Canterbury and Otago are more active and the number of new listings in those regions are up by a double digit percentage increase compared with the same time last year. The majority of the regions are also in a sellers’ market phase. Star performers include Northland, Coromandel, Bay of Plenty and Southland. 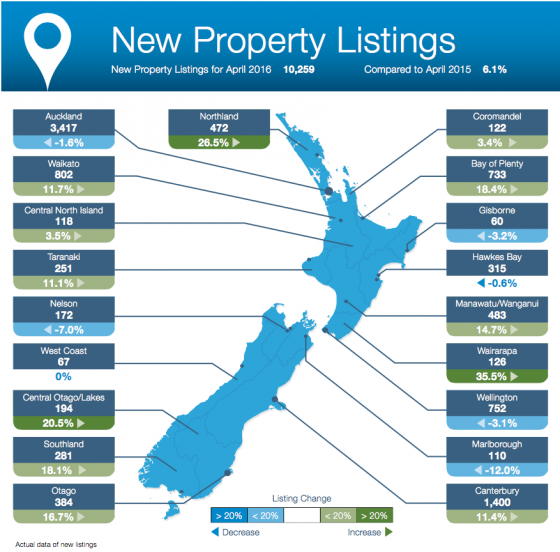 Northland, Bay of Plenty and Southland recorded significant increases in new listings (compared with April 2015). Northland, Coromandel and Southland recorded a healthy increase in average asking prices (more than a five per cent increase compared to the prior month of March 2016). Nearly all the regional centres saw a downward trend in the Inventory of Listings for April 2016 compared to the Long Term Average. 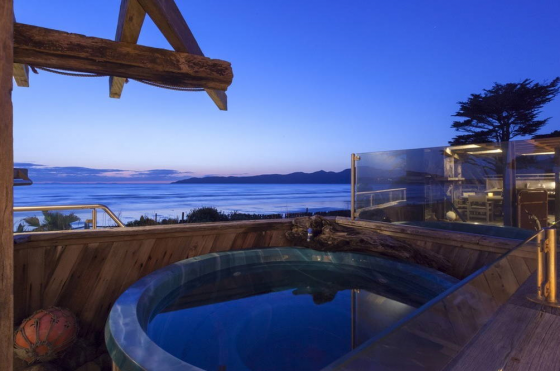 Realestate.co.nz offers buyers the shortest path to the perfect property. 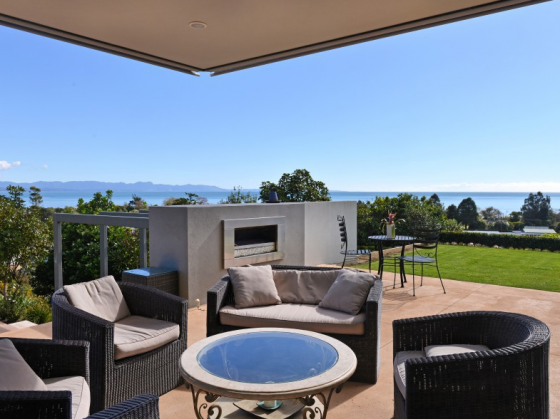 As the official website of the New Zealand real estate industry, Realestate.co.nz is dedicated to property and has the country’s most comprehensive selection of real estate listings online. The site presents more than 97% of all residential, commercial and rural properties currently marketed by real estate professionals. Focussed exclusively on people in need of property, Realestate.co.nz offers superior functionality, including accurate search, school zone data and a mobile app. Realestate.co.nz provides valuable property market data not available from other sources. New listings is a record of all the new listings on Realestate.co.nz for the relevant calendar month. As we reflect 97% of all properties listed through registered estate agents in New Zealand, this gives a representative view of the market. Seasonal adjustment is a method we use to better represent the core underlying trend of the property market in New Zealand. This is done using methodology from the New Zealand Institute of Economic Research. Truncated mean is the method we use to provide statistically relevant asking prices. The top and bottom 10% of listings in each area are removed before the average is calculated, to prevent exceptional listings from providing false impressions. Read more here. Auckland reached a new record high in average asking price in February of $866,080, an increase of $101,656 or 13.3% in 12 months, according to data from Realestate.co.nz, New Zealand’s largest website dedicated to property. 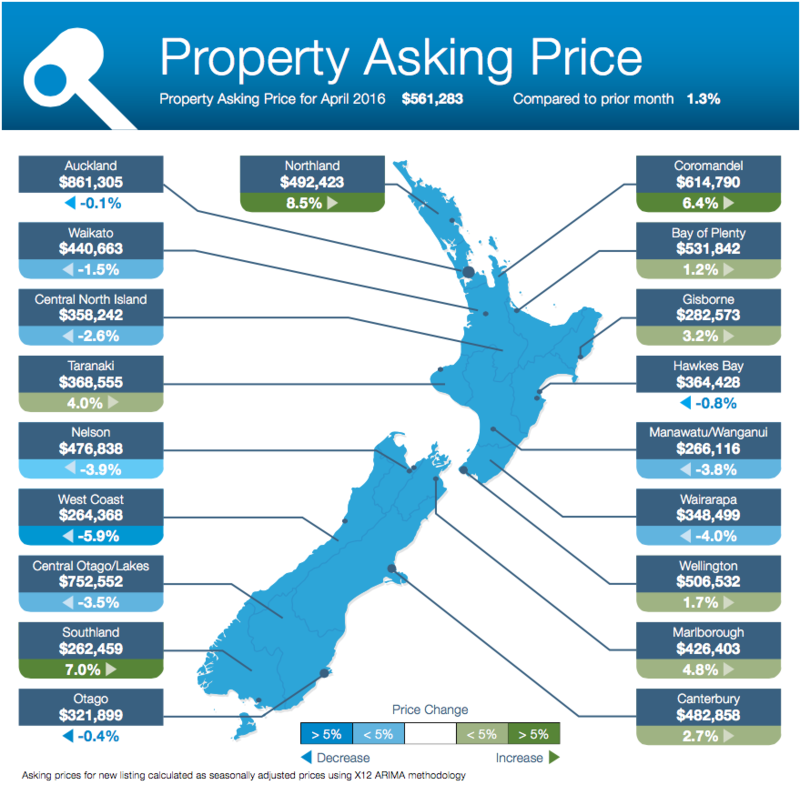 The average asking price in Auckland in February last year was $764,424, while the previous record of $851,531 was set five months ago in September 2015. 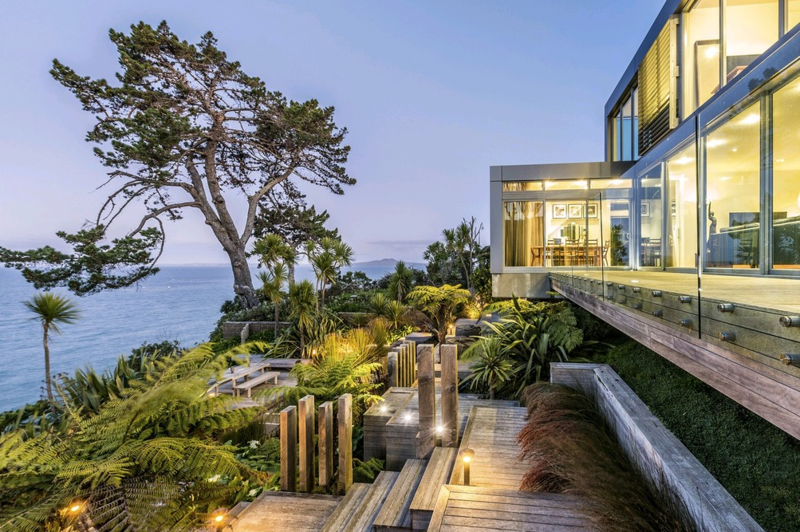 Brendon Skipper, Chief Executive of Realestate.co.nz, says “The national average returned to near record high levels in February, with three other regions in addition to Auckland also experiencing record highs: Otago, Hawke’s Bay and Coromandel. The national inventory of available housing stock sits at 16.4 weeks, easing only slightly from the record low set in January of 14.7 weeks. New listings for February across the country totalled 11,989, a return to expected levels for this time of year following a shortage of supply in December and January. 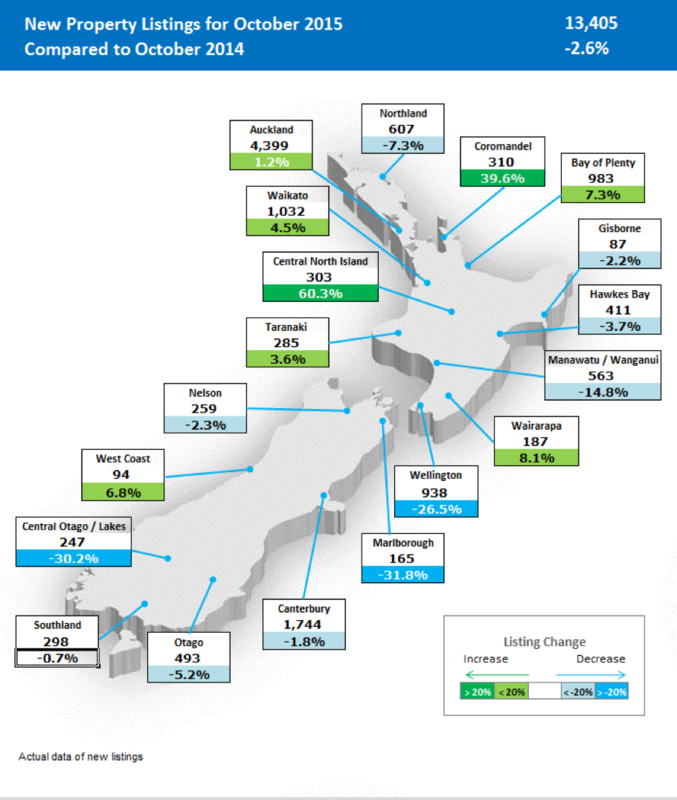 Auckland had 4,202 new listings, up 1.4% from February 2015, and its highest number for February since 2013. 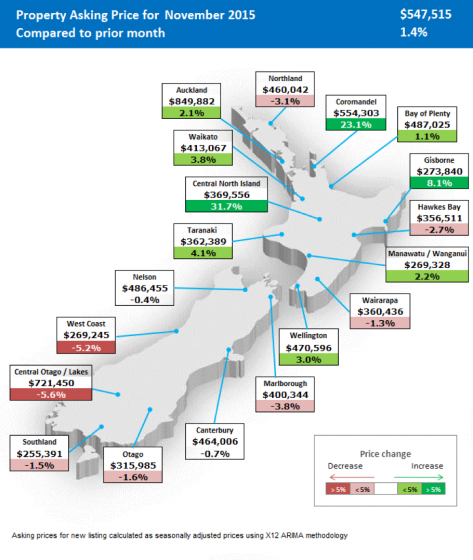 Wellington’s average asking price in February of $483,212 was down slightly from the record high set in January of $489,029, while new listings were also down 2.9% on February 2015. The average asking price in Canterbury in February was $457,358, a 5.4% decrease on January’s record high of $483,233, while new listings were at similar levels to the same month in 2015. 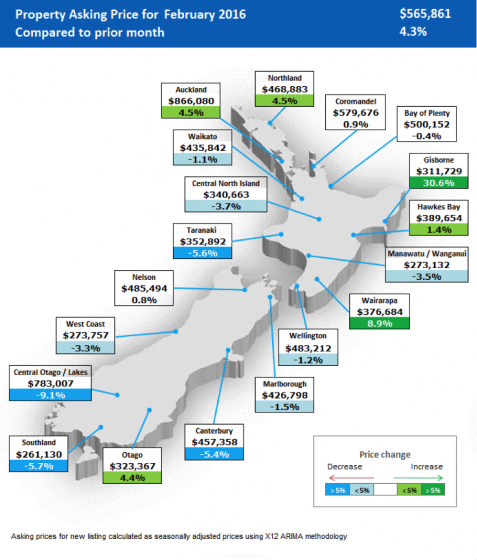 Otago reached a new all-time high in average asking price of $323,367 in February, up slightly on the previous high of $321,188 set in October 2015, while new listings were up 5.2% on the same month last year. 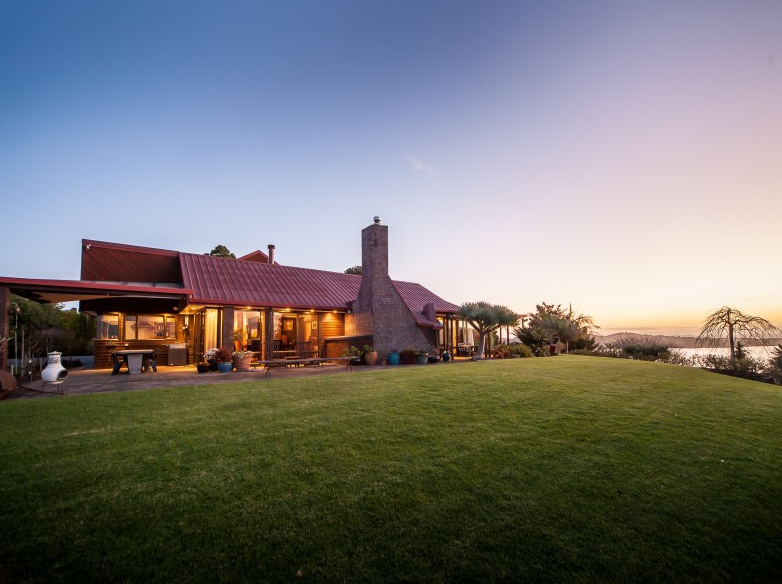 Hawke’s Bay experienced a new record of $389,654, up from the previous record of $387,504 set in August last year, with new listings down 8.3% on February 2015. 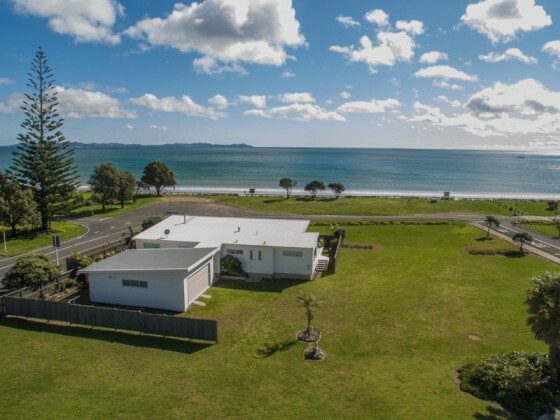 Coromandel’s new record high in average asking price was $579,676, up marginally from the previous high set last month of $574,271, though it saw a 7.7% decline in new listings compared with February 2015. Inventory is a measure of the national supply of homes for sale, expressed as the number of weeks it would take for all currently listed properties to sell at average rates, should no new properties get listed. The long-term national average is 34 weeks. 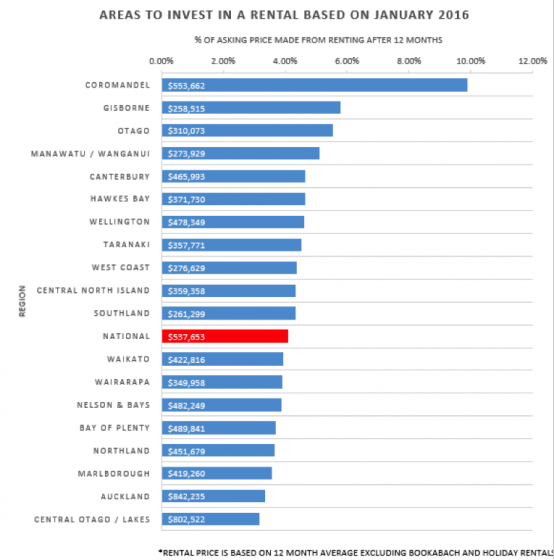 Gisborne, followed by Otago and Manawatu/Wanganui were the best performing regions for residential rental property investment in January, according to an analysis of data by Realestate.co.nz, New Zealand’s largest website dedicated to property. The analysis looked at every region in the country to identify which offered the highest returns for would-be landlord investors. Gisborne returned an impressive average of 5.78% on residential rental property investment in January, based on an average asking price of $258,515. 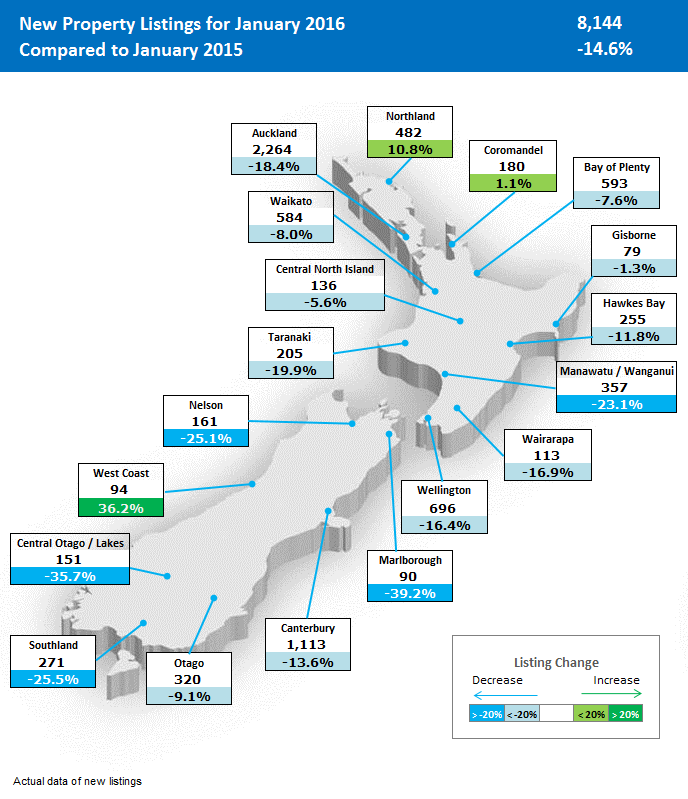 Otago returned 5.54%, and Manawatu/Wanganui returned 5.12%. The national average for rental property returns for the month was 4.10%. 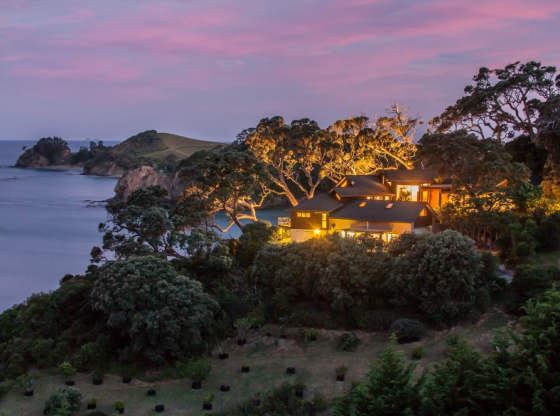 “While data shows the best performing region for rental property is Coromandel, we believe its unusually high average return of 9.88% is skewed by short-term holiday rental properties. Of greater interest for potential investors are the significant rental opportunities that exist in quite diverse parts of the country, in particular Gisborne, Otago, and Manawatu/Wanganui,” says Skipper. The rental property ROI data was calculated by comparing the average asking price of properties for sale by region across New Zealand in January 2016 with the average annualised rent in each location. The data assumes 100% rental occupancy, and does not account for inflation, mortgage interest payments, property management or maintenance upkeep fees. AUCKLAND, 3 February 2016 – A number of regions across the country experienced new record highs in average asking price in January, though this was off the back of a record low in inventory and a decline in new listings, according to data from Realestate.co.nz, New Zealand’s largest website dedicated to property. The national average asking price in January was $542,514, up 3.7% from December and ending a four month consecutive decline, though still short of the all time high of $568,215 set in August 2015. 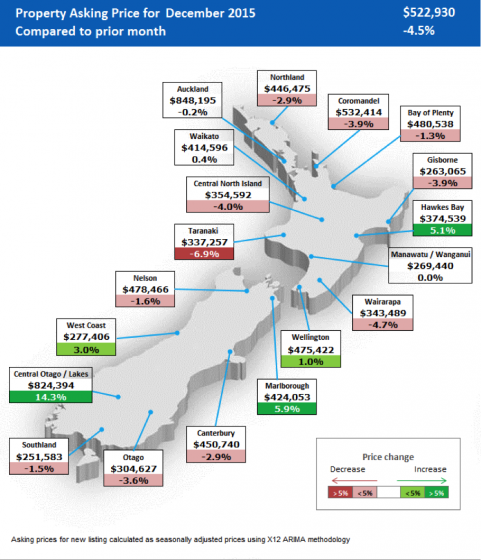 The average asking price in Auckland fell 2.3% to $828,629 in January from $848,195 in December, though Auckland also experienced a decline in listings of 18.4% from the same month last year. Eight regions of New Zealand experienced new record highs in average asking price in January. In particular, Central Otago reached $861,723, the highest average asking price of any region, and an increase of 4.5% from the previous high of $824,394 set in December, though new listings were down 35% from January last year. Bay of Plenty reached a new high of $501,961, up 3% from the previous high of $487,052 set in November, and only the fourth region in the country to break the $500,000 ceiling. New listings for the region in January were down 7.6% from a year ago. Other parts of the country to experience new record highs in average asking price include Wellington, Canterbury, Waikato, Taranaki, Coromandel and Southland, most however also experienced a decline in new listings from the same time last year. 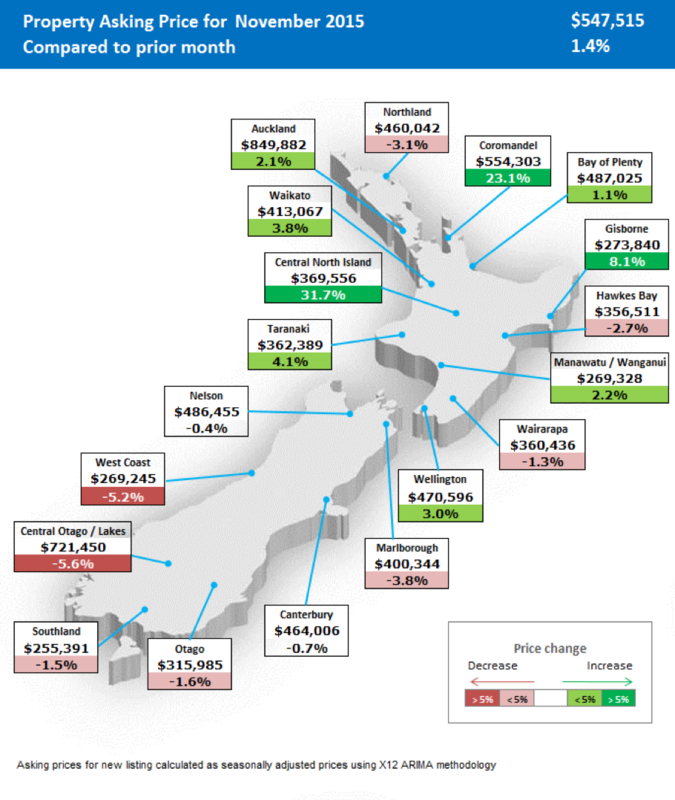 Wellington reached a new all time high in average asking price of $489,029 in January, up 2% from the previous high of $479,399 set in August last year, while new listings were down 16.9%. Canterbury experienced a new record of $483,233, up 1.3% from the previous high set in September, with new listings down 13.6% from the same month last year. Waikato’s new record high in average asking price was $440,784, up 6.3% from the previous high set last month of $414,596. The new record in Taranaki was $373,668, up 1% from the previous high of $369,791 set in February 2015, while Southland ‘s new high was $276,924, up 3.9% from the previous high of $266,398 set in January last year. New listings in January for all three regions were down from the same month last year. Coromandel reached a new high of $574, 271, an increase of 3.6% from the previous high of $554,303 set in November. It was one of the few regions to experience a small increase in the number of new listings of 1.1% from January last year. Whether you are a first-time buyer or an old hand, Stephen Hart of Hometopia.co.nz has some tips that will stand you in good stead during your house hunt. This is a highly competitive market. When you see the right opportunity you need to be able to act fast. You will soon be able to walk into an open home and make a surprisingly accurate assessment of its likely value. 3 How easy will it be to sell? Is there anything special about it? A view, a cul-de-sac, close to a kindergarten, great local schools, access to beaches, etc? If a home is just like all the others it becomes a commodity and the only way you will sell it quickly is by selling it cheaper than the others. 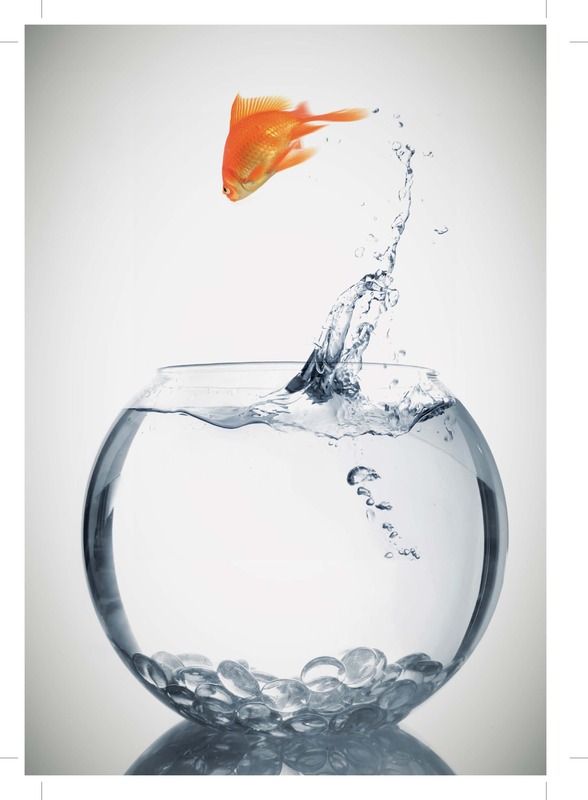 Negotiate hard and be ambitious about future capital gains. Remember, there is always another home around the corner. Stephen Hart runs Hometopia.co.nz – the free online resource centre for home buyers and sellers, and Auckland HomeFinders. AUCKLAND, 1 January 2016 – Central Otago joins Auckland as one of only two regions in the country where average asking prices of homes for sale now exceed $800,000, according to data from Realestate.co.nz, New Zealand’s largest website dedicated only to property. The Waikato also experienced a new record high in average asking price in December of $414,596, up slightly on November’s high of $413,067. “However Central Otago and Waikato were the only regions that bucked the national trend,” says Vanessa Taylor. The national average asking price in December was $522,930, continuing a downward trend from the record high set four months ago in August 2015 of $568,215. Average asking prices in Auckland and Wellington levelled off, but continued to remain near record-high levels. In Auckland, the average asking price was $848,195, marginally below the record set in September of $851,531. The average asking price in Wellington was $475,422, just below the August 2015 record of $479,399. Meanwhile in Canterbury, the average asking price in December fell slightly to $450,740, a 5.5% drop on the record of $476,818 set in September 2015. The total number of new listings across the country in December was 8,011, down 3.3% compared to the same month a year ago. 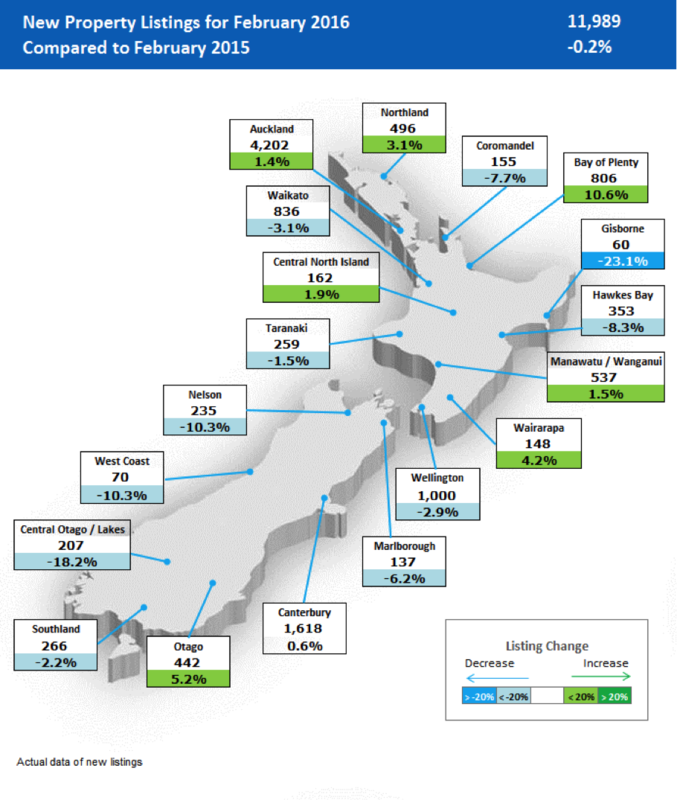 Auckland and Canterbury both had 6.6% fewer listings in December 2015 compared to December 2014, while Wellington experienced a more significant drop of 24.5%. “National inventory continues to remain near record low levels. For December, National inventory was 16.4 weeks, close to the all-time low of 16.1 weeks set in October 2015,” says Vanessa Taylor. Love the idea of an original weatherboard character home, or maybe you prefer something brand spanking new. 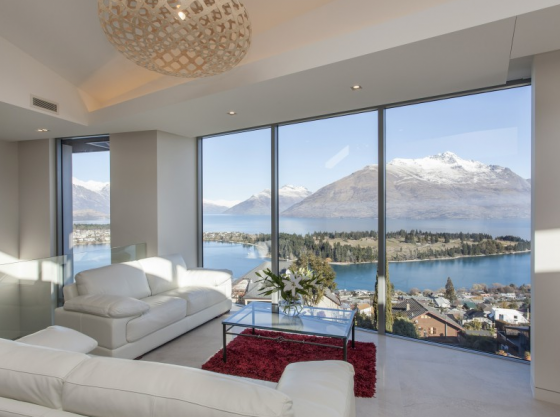 Well, before you plump for that ultra-modern pad, or start hunting for antique chandeliers for your ornate villa, Stephen Hart from Hometopia.co.nz considers some facts. New homes are built with today’s lifestyles in mind and are generally easier to live in. They are built with more bathrooms and kitchens are often integrated into living areas. Don’t expect an older house to be set up to effortlessly accommodate your media room. And yes, your 90-inch flat-screen television will look ridiculous hanging in the oak-panelled library. Flow was something else far from the minds of most Victorian architects, so celebrate the idea of corridors and cubby-holes, or rule out character homes. Historic or older houses will often be located in the more established city suburbs while most newer properties will be in recently developed areas further from the CBD. There are two plus points for the old home buyer. First, you know exactly what you are buying into when you move to an Epsom Fendalton or Eastbourne. Who knows what some of the new developer-created suburbs will eventually turn out like? Second, commuting to the city is easier from the old money suburbs. This is good for your sanity and will be good for your bank balance when you sell. Older homes often have a character and individuality that simply cannot be found in new homes. If an older home looks good now it will look good in another 20 years. That stainless steel and black glass exterior may look spectacular now but what will it age like? Is the design merely fashionable, or will it stand the test of time? Mature trees and established lawns add to the appeal of older homes. With new homes on a subdivision the buyer needs to have imagination to visualise how that scrappy vegetation between the bulldozers might one day develop into a lush tropical landscape. Or will it? Landscaping is expensive and some developers may be tempted to skimp on the orchid count. It’s funny how the charm and personality of your original villa can quickly evaporate when you are presented with cost of replacing the rotten floorboards that have just given way under your Victorian claw-foot bathtub. Get used to the fact that old homes require maintenance – some of it suddenly and in a big way – and if you are no handyman, that means expense. Make sure you factor maintenance and renovation costs into your purchase price budget when buying an older property. At least with a new home you get a warranty to cover any major problems while the house settles into its foundations. 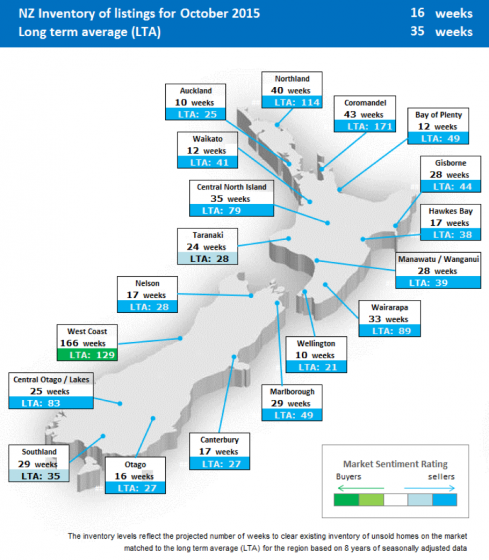 AUCKLAND, 1 December 2015 – The Waikato, Bay of Plenty and Coromandel regions reached record high average asking prices in November, according to data from Realestate.co.nz, New Zealand’s largest website dedicated only to property. The national average asking price of homes for sale continues to plateau, remaining just below record highs achieved three months ago. In Waikato, the average asking price in November was $413,067 (up from $403,640 in August). 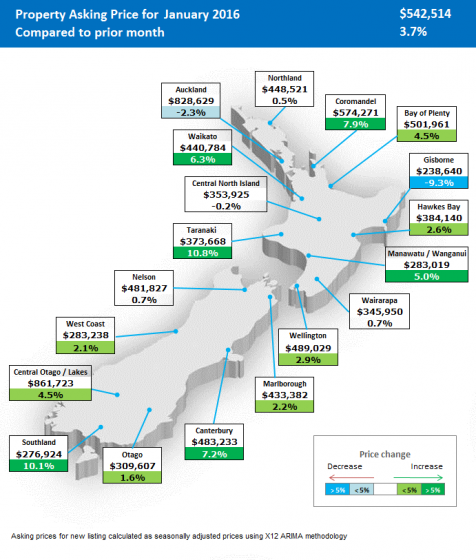 In Bay of Plenty, the new record is $487,025 (up from $481,730 in October) and in the Coromandel the new high is $554,303 (up from $539,597 in September). The national average asking price in November was $547,515, which is 1.4% up from October, but still slightly down from the national record of $568,215 in August. 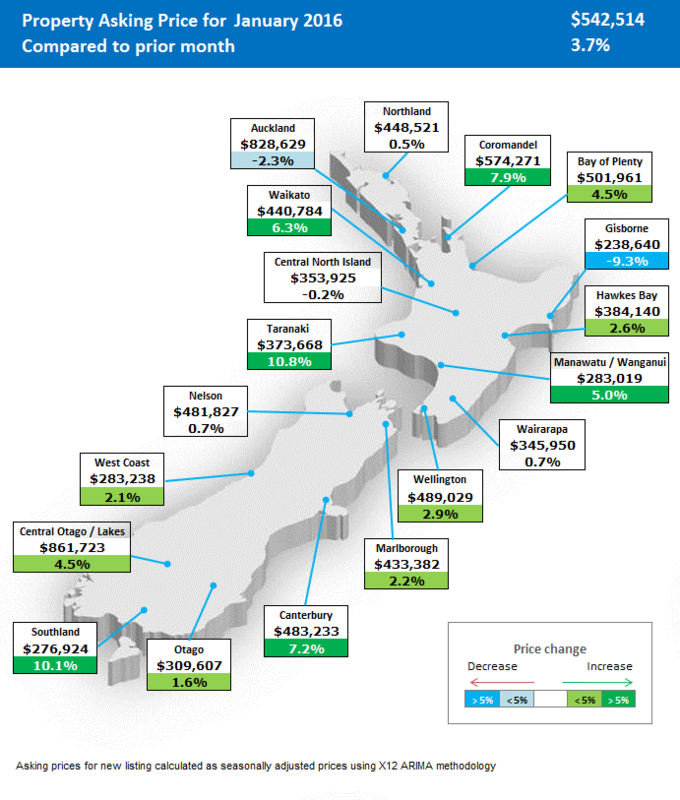 In Auckland, the average asking price of $849,882 was marginally lower than the record of $851,531 in September. In both Wellington and Canterbury, the average asking prices for November were within $10,000 of the record highs achieved in August and September respectively. 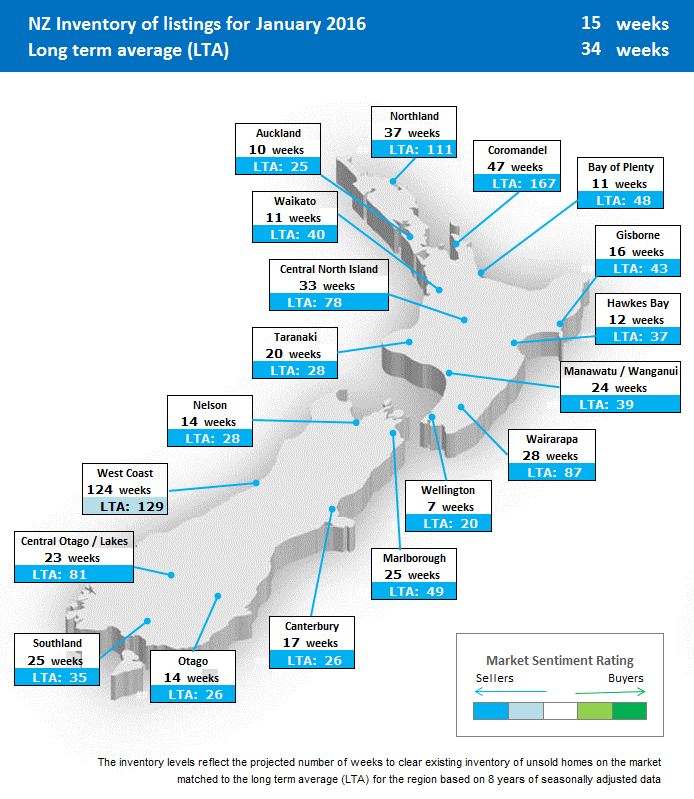 Auckland dominates the market for apartments nationally, accounting for 71.9% of all national apartment listings. New listings nationally show a 5.6% reduction from the same month last year. Auckland had 7.0% fewer listings this November compared to November 2014, Wellington had 16.7% fewer and Canterbury had 5.1% fewer. 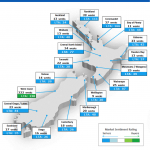 Again, the Waikato, Bay of Plenty and Coromandel are among the regions bucking this trend. All three of these regions had the most new listings for any November for at least five years. Inventory is a measure of the national supply of homes for sale, expressed as a number of weeks it would take for all currently listed properties to sell at average rates, should no new properties get listed. The inventory for November was 16.8 weeks, compared to a long-term average of 35 weeks. AUCKLAND, 3 November 2015 – The traditional surge in new properties coming onto the market in spring is well evident this year. Coupled with this, average asking prices nationally have eased from record highs in recent months, according to data from Realestate.co.nz, New Zealand’s largest website dedicated only to property. “The number of new listings coming onto the market in October is up significantly on last month, as we have come to expect in spring,” says Brendon Skipper, CEO of Realestate.co.nz. A total of 13,405 new properties were listed in October, 12% more than there were in September. “It may well be that the supply of properties plays its part in the slight easing in asking prices we’re seeing,” says Skipper. After many months in which new record high average asking prices were recorded both in national terms and across many regions, these prices have levelled off in October. Nationally, the average asking price of $539,823 in October continues the downward trend from the record high of $568,215 in August. 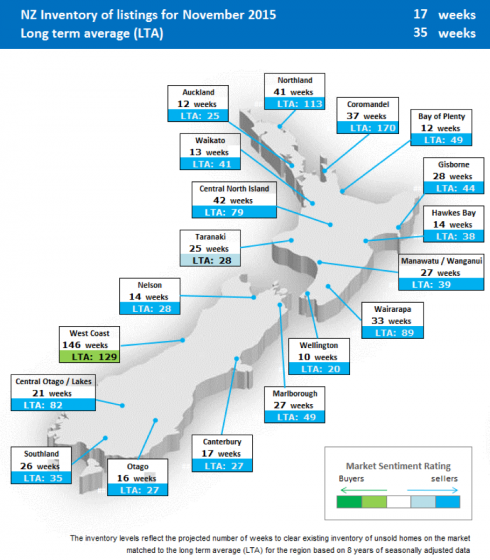 The average asking price went down in eight regions, including all the main urban centres. Price increases were recorded in seven other regions, while it remained static in four. In all main urban centres, average asking prices dropped slightly from recent record highs. In Auckland, the average asking price dropped back to $832,713, after the record high of $851,531 in September. In Canterbury, the average price dropped to $467,403 after their record high of $476,818, also recorded in September. In Wellington, the average asking price dropped to $457,028 from $479,399 in August, while in Waikato the average asking price in October was $397,991, down from $403,640 in August. Only two regions bucked the trend, reaching new record high levels in October. In Otago, a new record high average asking price of $321,188 was recorded , up from the previous high of $308,915 achieved in June 2015. 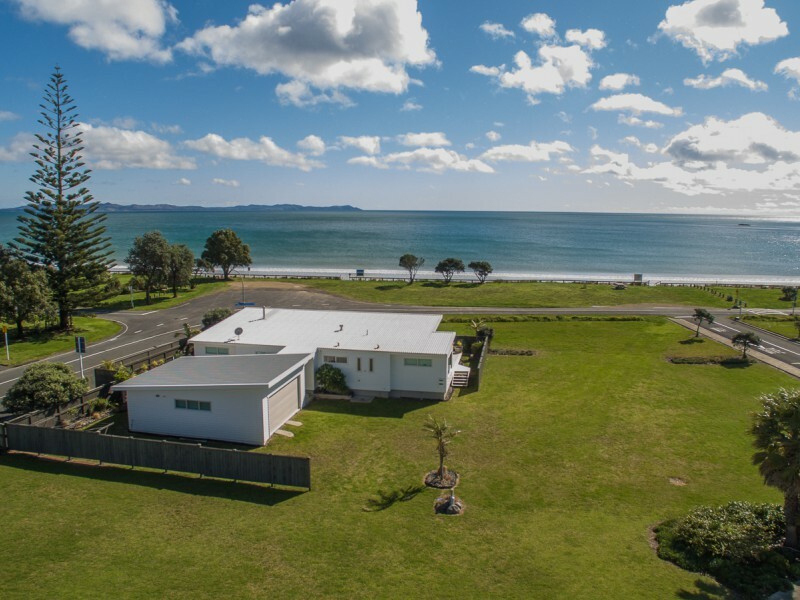 In Northland, the new record high average asking price is $474,756, which is only marginally higher than the previous high of $474,738 achieved in June 2014. Inventory is a measure of supply and demand that indicates how long it would take, in theory, for all the current properties on the market to be sold at the average rate of sales. The national average inventory in October was only 16.1 weeks, even lower than the record low of 16.3 weeks reached in September. 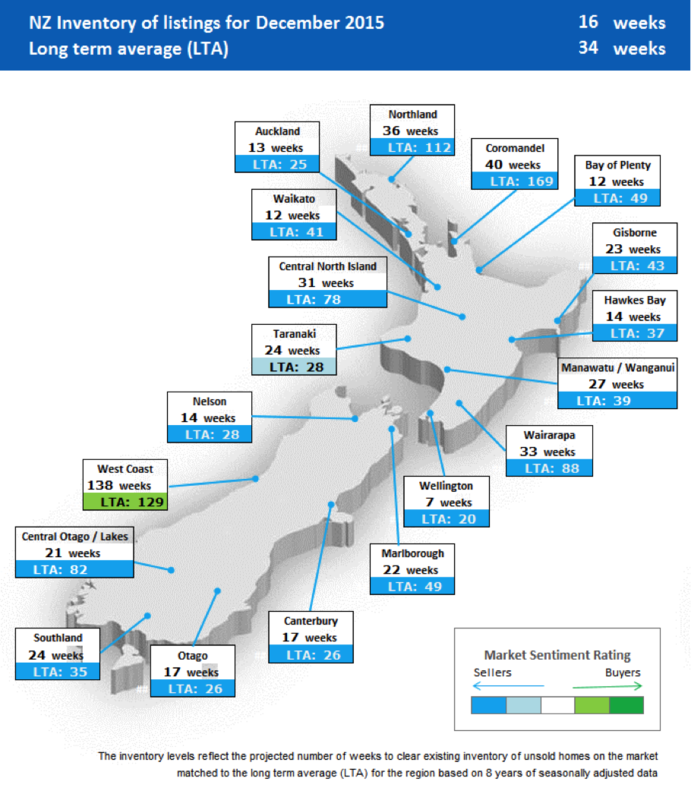 In three regions neighbouring Auckland, inventory is well down, in each case less than a third of that region’s long-term average: Waikato (12 weeks vs. 41 average), Bay of Plenty (12 weeks vs. 49 average) and the Coromandel (43 weeks vs. 171 average). Another region with a wide discrepancy is Central Otago, which in October had 25 weeks of inventory compared to the long-term average of 83 weeks. 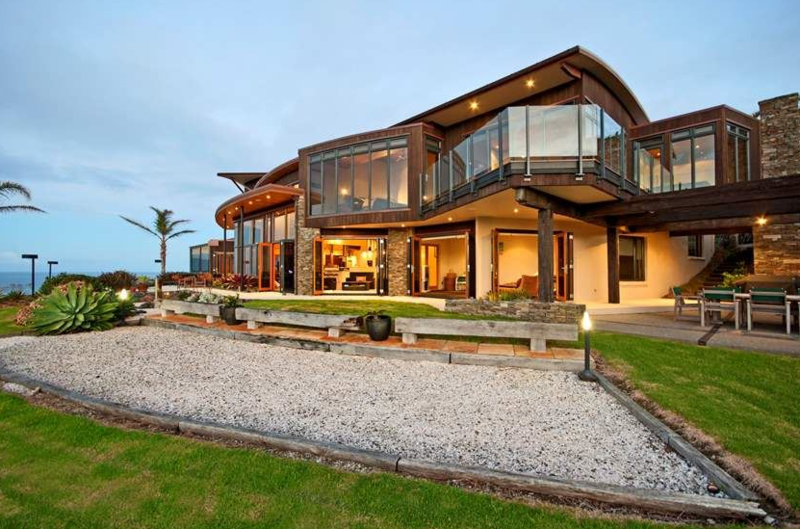 Realestate.co.nz offers buyers the shortest path to the perfect property. As the official website of the New Zealand real estate industry, Realestate.co.nz is dedicated to property and has the country’s most comprehensive selection of real estate listings online. The site presents more than 97% of all residential, commercial and farm properties currently marketed by real estate professionals. Being focussed exclusively on people in need of property, Realestate.co.nz offers superior functionality, including accurate search, school zone data and a mobile app. Take 23 acres of productive vineyard, add a covenanted native plantation and views from every room for a home without equal. Spanning a total floor area of 1013 square metres, features include: indoor in-ground heated infinity salt water pool, spa pool, sauna, gymnasium, floodlit tennis court, and theatre with a wet bar. All four bedrooms are luxuriously sized with their own en-suite, it’s like living in an international five star hotel. 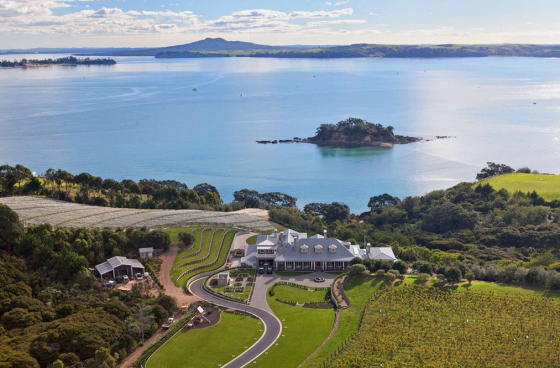 Take a premium waterfront position in the heart of Doubtless Bay. Enjoy relaxed beachside living in this highly sought after location. Designed to soak up the sun and sea views, the well-maintained house opens out to a wrap around deck and a large easy-care section that blends into the beachside reserve. Enjoy long summer evenings on the outdoor living areas include a covered alfesco dining area.